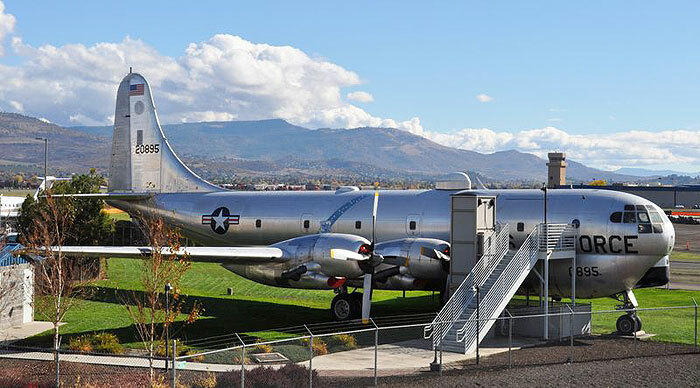 The Rogue Valley International-Medford Airport is home to this unique historic aircraft. The plane is available to rent for meetings, events, or parties. The Boeing KC-97 was part of the Strategic Air Command and its versatility as a multi-purpose aircraft allowed it to be used as a troop transport/cargo carrier/hospital ship and in-air refueler. As a cargo carrier it moved heavy equipment carrying light tanks, ambulances, artillery or a combination of these. Some early models were called the “flying ambulance” and were used to bring Korean War causalities back to the west coast from Japan. The quick convertibility of the KC-97 from basic freighter to in-air refueler was made possible by the unique packaging of the tanker equipment and flying boom. This particular aircraft was built in 1952 and was delivered to the 306th Bombardment at MacDill Air Force Base, Florida in September, 1953. Over the years it has been deployed to Germany, Morocco, Newfoundland, and Lajes Ab Azores in support of unit movements and special operations. This aircraft continued its service with a number of Strategic Air Command units before its retirement in 1978 at Davis-Monthan Air Force Base in Arizona. Her final flight was made in November of 1990 to what was then the Medford-Jackson County Airport. Here she was lovingly restored to be enjoyed by future generations. -Wheelchair/handicap access available (24 hour notice required). -No food preparation facilities on board. Catering is welcomed. -Completely equipped w/heating, air-conditioning and electricity. -Tables and chairs available (for 49 person capacity). -Renters are responsible for any missing items, and subject to prosecution for theft. -24 hour cancellation notice requested. -No smoking or alcohol permitted. Bounce-houses or other inflatables are not permitted. -Parking is limited, so carpooling is encouraged. *Subject to change per Jackson County ordinance. Open for viewing Saturdays from 9-10 a.m. at no charge. The KC-97 Book is available at the Airport Administration Office for $5.00.